This month has seen an almost unparalleled focus on one subject. All I have painted or played has been my 54mm NorthWest or Cyprus Hills game. Its time to switch focus for a few weeks so beware of Tricornes in September, and maybe a few other things. Yesterday saw one last quick game. Really it deserves a full telling and narrative but not only was I tired but I was called away several times by duties as jack of all. Now, the memories are fast fading and the pictures too few and too poor so this will be a quick "fare thee well till we meet again" post for the 54's. Don't worry, they'll be back well before Christmas. 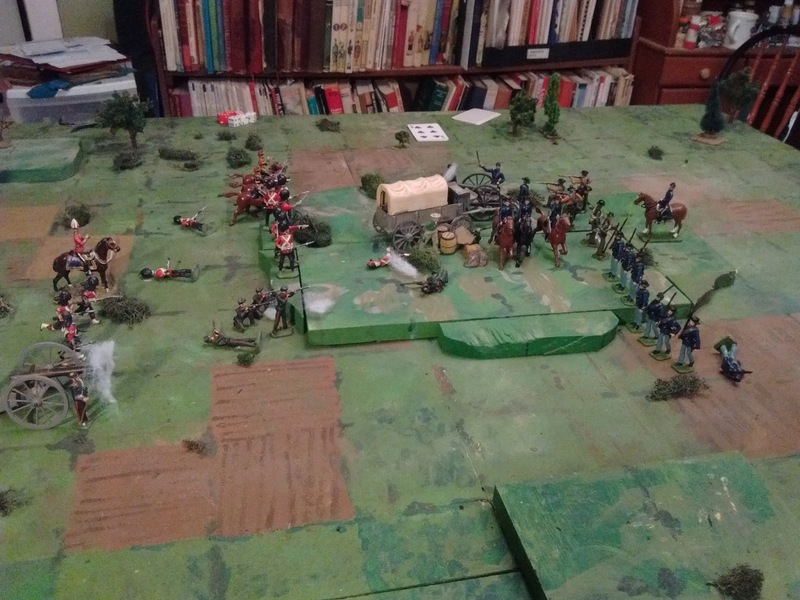 Its been 5 1/2 years since my Britain's engaged in battle at Hook's Farm and it seemed like as good a scenario as any to close the month with. The Canadian and US forces meet again at the site of Hook's Trading Post and Firely Mission. Each side having by arrangement a General, 2 Colonels, 2 cavalry, 6 infantry, and a gun. I have been fearing, and working to avoid, this moment for 6 years now. Having cracked open the 54's and tried out actual toy style fashions on them, its going to be hard to keep them from expanding out of the box. Not only does that threaten the "No duplication of period, game scale and theatre of war in different figure sizes" rule but also the space distribution in my room, especially since "54mm wars" creep threatens. We'll see. 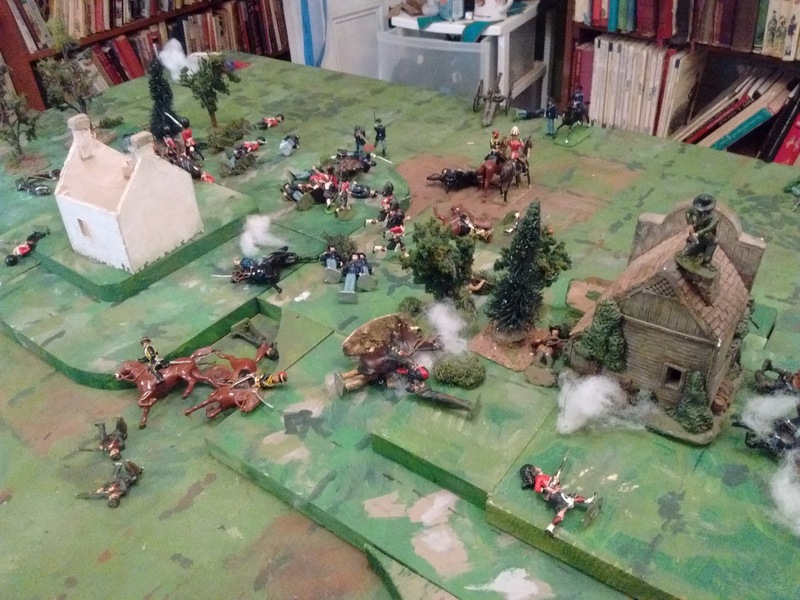 A cavalry clash goes terribly for the Canadians but the Highlanders hold steady. 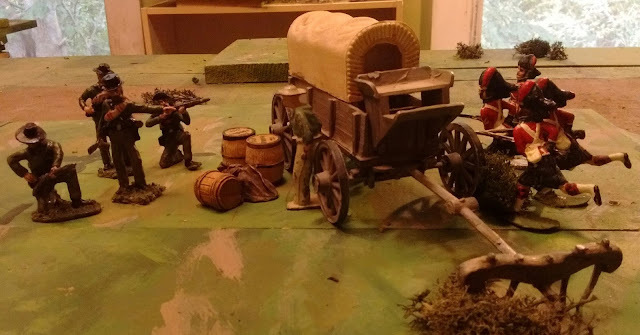 They are unable to drive the Irish from the Whiskey Trader's General Store however and eventually Douglas concentrates on his left. Another old fluctuating choice beckons as well. 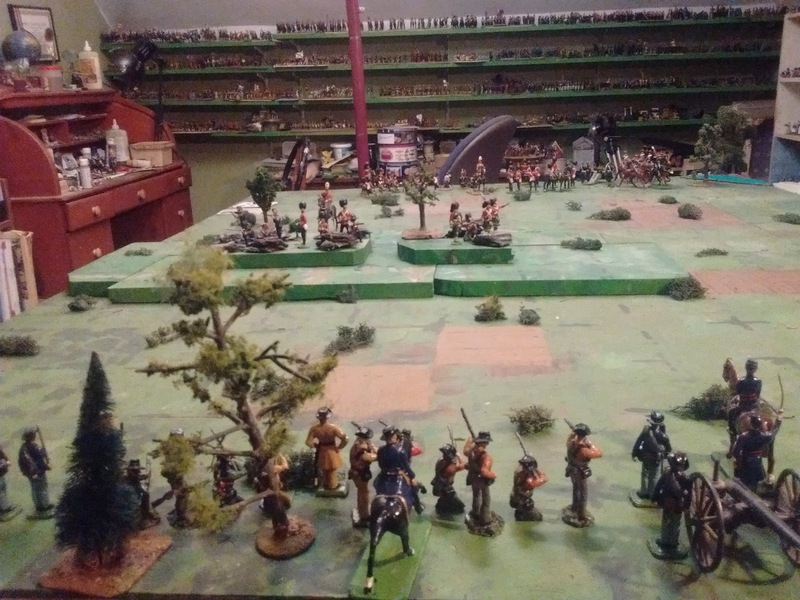 When I started in 54's around 1995, I wrote a set of 1 stand = a unit rules but got drawn into Old School singles for Colonial's and for the War of 1812. Ever since I've felt the pull back to one base units and its strong now. I like knocking figures over for photos for a while but eventually the novelty wears off. With small units, not only does it look odd to me to have a single figure left as a functioning unit and not only are stands easier to deploy and clear away and less prone to damage but I just have this odd irrational attraction to the idea of Permanence that a fixed and labelled stand has. A neat contrast of Permanence for toys, things which are usually considered Impermanent by nature. A question for later. The end of turn 15 and with each side holding 1 objective, the American morale collapses. They have only 4 of 9 units left in action while the Canadians still have 6. 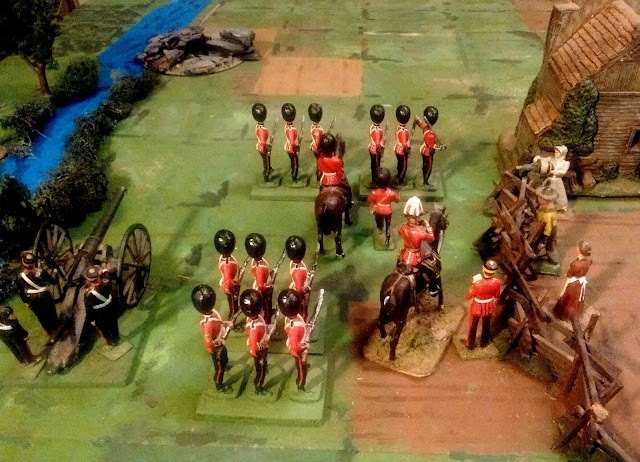 Three turns earlier the Canadians had been behind thanks largely to the astonishing combat and rally dice of the Black Horse cavalry. E troop I'm afraid fell prey to "new unit syndrome". I didn't manage a game this weekend but I did make time to cast 3 heads and convert 3 more Britain's Light Dragoons into US cavalry. 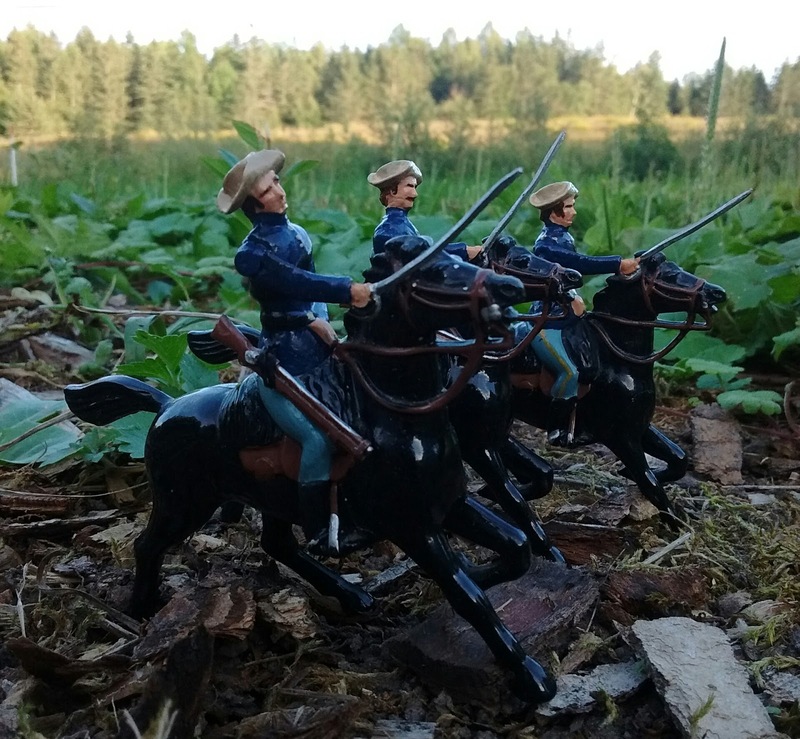 E Troop charges across the plains. Good thing they aren't the next Troop. After another entertaining game at Ron's yesterday (WWII Grant scenario using Airfix Battles), I came home and started to clear my table. I thought that might make it easier to work on the ACW scenario I have started to plan, a sort of "inspired by historical events" thing rather than a refight. The OHW scenarios call for units to be between 4" and 6" wide on a 3 ft x 3 ft table. Normally I double the number of units so that my forces occupy the same footprint on my table as 6" wide units on his but since I didn't have enough refurbished Indians I went with one and a half times the number of units equating to the footprint of 4" wide units. This gave me 6 units of Indians attacking what was meant to be 6 American units on the hill with 3 in reserve but I just realized that I had only placed 3 infantry, 1 gun and 1 cavalry on the hill or in other words, all of the painted American forces but short one unit. Oh well, it happens. 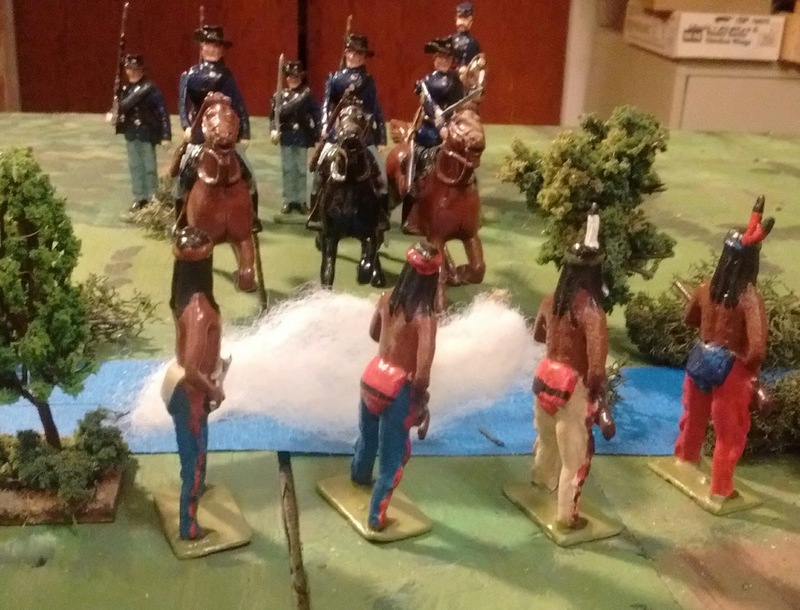 In my rules the Cree, Blackfoot and Assiniboine move quickly, mounting or dismounting as required without the horses being shown or running on foot when required but have reduced firepower to reflect their lack of ammunition and modern firearms at this point. They also have a lower melee value and unit strength to reflect their preference for skirmishing tactics on foot and their inability to afford heavy casualties. In game terms this forces them to make the most of their manoeuvrability to surround vulnerable enemies with concentrated mid range fire and the use the Give Ground rule to minimize losses. It worked like a charm. The Indians quickly flank the hill but lack the assault capability to carry it in a rush instead converging fire to drive back the Volunteer units one after another.. It took a while to adapt to the 'only two units may move or fight' rule for the Americans (2x1.5=3 units here) but I did let units defend themselves in melee and once I got a feel for things it worked without feeling silly. After some hemming and hawing I decided that rallying counted as moving or fighting. At first I worried about trying to rally units on the hill who had been shot up or forced back but eventually I just left them as speed bumps and moved at least one reinforcement each turn. This resulted in the Indians taking almost all of the second contour but since the contours kept blocking their line of sight when the Americans gave ground and they had taken losses and couldn't really afford to assault except as a last resort, it took time to follow up between shots given the Yanks a breathing space. I only succeeded in bringing up two of the reinforcing units but they were decisive in counter attacking the hill. It did not help that with Strombecker at their head, they were rolling buckets full of 5's and 6's. On turn 15 an unsupported charge by B Company retook the last peak and a desperate last ditch assault by the remaining battered Indian units was swept away by defensive fire breaking their army morale to achieve a decisive victory for the boys in blue. General Byrd went down while rallying a volunteer unit but Colonel Strombecker came up with the reserves and retook the hill in a series of assaults. Now, back to trying to write the rules to accurately reflect the way I actually play the game. Oh and there's that 1/72nd ACW thing..........might take me to the Labour Day weekend to get that on the table. It had been a long hot march. Scouts reported no sign of the Americans so General Douglas ordered Colonel Marten to occupy Stony Heights with a picquet of three companies, one each from the Rifles, Grenadiers and Highlanders then gave the rest of the Column permission to camp by the river and make supper. Six companies of infantry, two troops of cavalry and a 9 pounder gun, as fine a force as a man could want. A short time later a bugle sounded from the ridge. By the time a galloper arrived with news that the Yanks were at hand, shots were already ringing out from the hill. South of the hill, General Byrd surveyed his new command with satisfaction. On his left was a battalion of regulars, 3 companies strong under Colonel Strombecker, In the centre 3 companies of tough Volunteers, on the right was Colonel Lannigan with a gun and a troop of cavalry to secure the flank. It appeared the enemy had been taken by surprise, all the better. He gave the order for an advance all along the line. As the enemy opened a hesitant fire the artillery galloped forward, unlimbered and poured fire upon the hill. The Canadians had good cover amongst the rocks on the steep crest but his men would winkle them out. Forward went the Blue line, pausing briefly to pour in fire while B and C companies manoeuvred around the flank. The whole then cheered and charged up the hill. To the surprise of all, they were met by a deadly close range fire and tumbled back down the hill, carrying Colonel Strombecker with them. Poor Strombecker, finally back in uniform after being sidelined for many years and there he was, a ball in his shoulder before the battle was fairly under way. Two repulses and the Canadian main force approaching, this day was not going according to Byrd's plan. Fortunately for the Canadians it seems that most men had not even unbuckled their equipment yet and in no time at all half the companies had formed up, deployed and were advancing on the hill. The remainder were not far behind. As they hurried across the plan they could see the white helmet of Colonel Marten silhouetted against the sky as he rode back and forth, steadying the men. The firing rose to a crescendo followed by a round of cheers from the hill top and then by another crash of fire. Now a trickle of wounded men could be seen making their way back down the hill. The Highlanders picked up the pace and raced for the hill as the firing intensified for the third time. Suddenly Colonel Marten could be seen rising in his saddle and then sliding to the ground. One last desperate push and the Americans had the hill but could they keep it? General Byrd looked around, this was not going according to plan. The enemy's cavalry had appeared and stalled the whole damn right flank before being driven back at the cost of Colonel Lannigan who had led the cavalry charge that saw them off. Most of the bloody volunteers were hovering at the foot of the hill refusing to reform and move forward. Thank god for the regulars. At the third try they had captured the western peak, capturing the remains of the garrison who had refused to run. Now to regroup and hold till nightfall. He spurred over to harangue the volunteers. Three times the Canadians stormed up the hill and three times they were held and thrown back down. Would one last push do it? As the sun set General Douglas stared at the bloody hill side through the powder smoke. The heaps of dead and wounded were thick enough to impede the charges of those few still obeying their officers' orders to advance. Too many lay crouched in the long grass, occasionally loosing a shot or two before slipping back down the slope. The nco's and officers were busy gathering up the stragglers but two of his Colonels were down and who knows how many hours it would take to get the men back into any kind of fighting shape. He ordered the buglar to sound the recall and sent a runner to recall Colonel MacDuff who was still pressing the enemy on the western peak. Let the Americans have the damned hill for now. ps for those worried about the amount of tin spilt, the rules assume roughly 10% of "hits" to be killed, wounded or missing, the rest are just those not functioning well or short term stragglers who will be ready to fight again in a few hours. 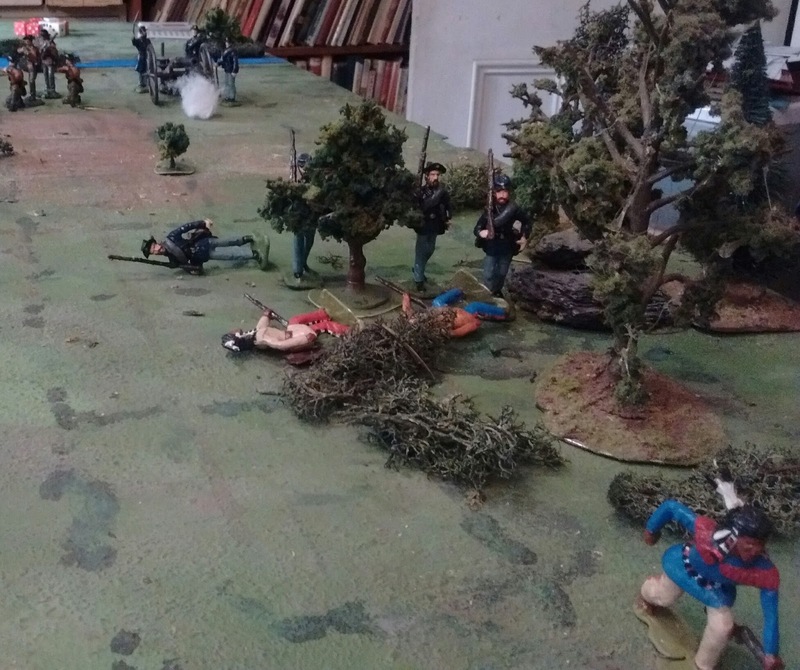 So, that was the Battle of Stony Heights, an improvised solo scenario. The goal for the smaller (8 units vs 12 units) American goal was to seize and hold at least two of the three hill top areas. The Canadian goal was to hold on to all 3 hilltops. Something in the middle would have been a draw. That was assuming that neither army broke, something that wasn't that far off at several points. 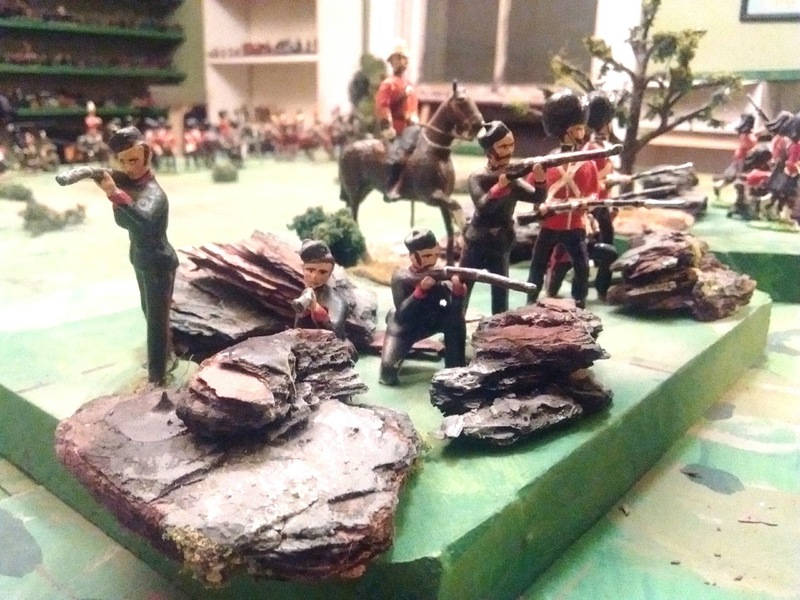 One quarter of the Canadian force began in position on the hilltops while the rest were gathered in the back corner near a grove on the river bank and needing to roll 4,5 or 6 to form up. When six units formed up on turn one and the rest on turn two I was afraid that was too lenient but it was a long way to go and they barely made it in time. The game lasted all of 15 possible turns and nearly 2 hours. It came close to being over earlier at least three times but the dice, as usual, were fickle, favouring first one side then the other as if they were determined to prevent an early win by either side. The Americans regulars in particular had phenomenal rally rolls whenever they had a chance (rallying allowing them to recover some stragglers etc.). This meant that although suffering heavy losses in taking the hill, they were able to use several brief respites to rebuild their staying power before the next wave of attacks. Oddly enough, since there were no modifiers used, the Volunteers and Canadian militia had a very hard time rallying! This is the level of game that I was originally picturing for this campaign with the option for smaller 1 hour skirmishes and at some point a full afternoon's battle with 15 or 16 units per side. I'll need another pair of Britain's field guns for that and I'd just as soon not mix in plastic ACW ones to make up numbers. Time will tell. As far as the rules go, I realized before the game that I had concerns with some of my rules choices. The first was command control and sequence of play. Part of me likes the DBA PIPS idea and part of me hates it and finds it tedious or has trouble fine tuning it to work with large and small "armies", especially including the group move where a Colonel is controlling several companies. For the last two games I went back to the older system of initiative and chance cards. For small games it sometimes seems too easy but for this size and up there are enough other rules interfering that I constantly have trouble getting the troops to do just what I want once battle has been joined. This game has convinced me that this is the route I should stay on. However, I still wanted a "command & control" function for Colonels. In the past I have tried rolling for "out of command" units who were too far from their commander but in a fast paced game I always keep forgetting to check. One option is to have a pre-turn "mark out of command units" phase but a rule I can't remember mid-game is a bad rule in my books and to be honest, I don't miss it. Instead, I decided to try resolving melee immediately so that there could never be two units ganging up on one unless a Colonel was leading a group. This was even worse. I am so used to melee being at the end that I kept screwing it up plus it ended in units sometimes having to fight off multiple waves of attackers in one turn or being able to support in one fight then fight in another and so on. To lessen the confusion I also had to outlaw tied melees. It was exciting sometimes to have a bloody 4 or 5 turn melee but in the long term it made the game over all less exciting as there was too much die rolling and not enough sound tactical thinking and I missed the narrative of prolonged close fighting. In the end I decided to go back to "Old School" with no role for subordinate commanders beyond rallying troops and boosting their performance in close combat. The rest is "factored in". I also noticed that there were several small, unwritten, rules in force and some other minor things which I tended to differently that what was written so editing of the rules has resumed. My goal is to work backwards and actually describe what I do and cast in it print rather than inventing new ways of doing things to be different or to respond to a whim. Lastly, most of August has been focused on this 54mm revival and I think its time for a short break. If all goes well I expect to have time for a full game next weekend. I'd like to do a big Elastolin Medieval/Renaissance game but they need too much work. Now..should it be 20mm ACW or 40mm Atlantica? So much for today's game. Luckily there is tomorrow's game to look forward to. The Picquet keeps a sharp eye out. 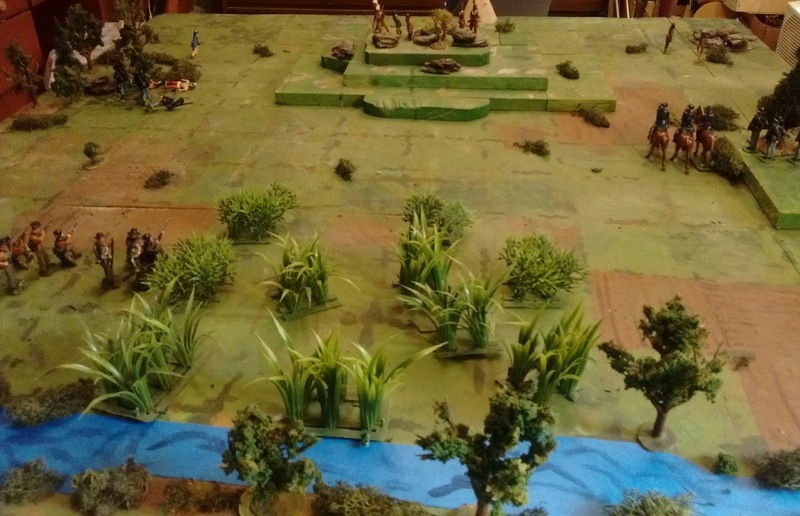 I was set up to play scenario #29, Shambolic Command, from One Hour Wargames. The premise of the scenario is that a larger force with command issues is attacked by a smaller but more efficient force. Since the US commanders in my setting might be battle hardened while the Canadian ones wouldn't be, it seemed appropriate. As is now my custom, I set up the table with double the number of units to match the foot print and fit better with my rules, so 8 units attacking 12. What is supposed to balance the scenario is that the defender may only use two (doubled to four since my forces are doubled) units each turn to move or engage in combat. I had trouble with the thought of troops not returning fire and with try to balance group vs unit moves. The selected scenario set up to play this morning. To cut this short, the combination of rules, scenario and setting just weren't working for me so after four turns which saw the smaller American forces shot to pieces, I decided to quit. After much pondering I decided that the scenario/rules issue probably could be fixed and that I need to do some serious thinking about command control systems vs numbers of units on the table but that I didn't want to do either right then. So I reset and changed the scenario to "reinforce the hill" with 3 companies on a hill are supported by 9 in camp against an attack by 8 enemy. An overview of the new setup. However, by then time was up so if all goes well I'll play on Monday. I was too fatigued to do much today but I did manage to refurbish more toy soldiers! Refurbished 53 year old Britain's Life Guard and 3 Herald Confederates along with a homecast Guards officer with a headswap and change of coat colour. Reinforcements have arrived! First off, three plastic Herald Confederates that I picked up at a flea market a decade or so back with a coat change (hence galvanized). I needed an extra figure so, enter: a homecast British Guards officer with headswap and a blue coat . Not quite the same as the original officer but then I never really like the way he was twisted around (not that I've ever owned one myself). Then there is General Byrd. This gentleman first served many years ago as an officer in Britain's Life Guards. He was then forced to transfer into the 2nd Dragoon Guards before finally ending up in America. We will ignore various rumours about his reasons for leaving but it is well known that he bears a grudge against Her Majesty and those who serve her. Since he has seniority he has taken control of the force at the border. This doesn't bode well for a peaceful wait for an official resolution. When I was 12 I got a copy of Henry Harris's book on Model Soldiers (a French version published in Belgium but I managed). Inspired by Harris and not yet in possession of any books that explained just how one played a real wargame, just tantalizing mention, I proceeded to convert pretty well ALL of my old toy soldiers into Model Soldiers. Much less toy like. This Britain's Life Guard officer was transformed into a late 17thC officer based on an illustration in Barnes' History of the Regiments and Uniforms of the British Army. (Did I mention that I had great parents?) I had hoped to save the hat but it was a mixture of plastic, paper, putty and built up acrylic paste and crumbled. The arm was also old plastic so I replaced it rather than just the hand. The coat tails are also paper but I managed to keep them. There is another home cast company on the painting table then time for an attack defence scenario with 8 US units being attacked by a larger Canadian force, hopefully on Sunday. Its been "One of those" weeks. Not much time or mental space for hobbies. I did manage to squeeze in a partial play test of 1/2 of one of the Fall In games. The revised MacDuff rules are now so fast and bloody that it may be necessary to add more troops, or complexity to the scenario or else adjust the rules. Needs some undivided thought. (btw those Abenakis behind the British are French allies. 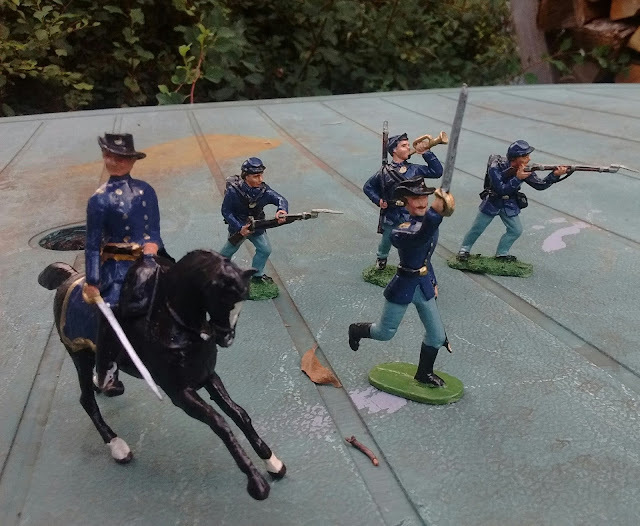 At least today I found time to cast a few figures and by the weekend I hope to see 2 more US companies on the table, umhh, possibly along with the headstrong, glory seeking, yellowed haired cavalry Colonel Byrd, commonly addressed as General due to his brevet rank at the end of the civil war. I have other things to do, like preparing for Fall In as well as yardwork but I didn't feel like working and I wanted to complete the groundwork for future Toy Soldier games before getting back to other games. I needed to show how hostilities broke out between US and Canadian forces. Saturday night, the Irish and some young Montreal Scots meet at the Whiskey Wagon. What could go wrong? So there we were on the 13th of August, a hot muggy day. Colonel Douglas had led his expedition to the site chosen for Fort MacDuff. A low hill near the border with good observation and a spring nearby for water. It was a surprise when Colonel Lannigan showed up the next day with an equal force to protest that the hill was in US Territory. This was an argument that could only be settled one way, by surveyors. Both forces drew back and camped to await a decision. The American fire is hot but the return fire eventually drives them off and the Grenadiers will charge and take the American gun. The initiative and advantage swayed back and forth, the Americans took early control of the hill and out shot the Canadians 2 to 1. 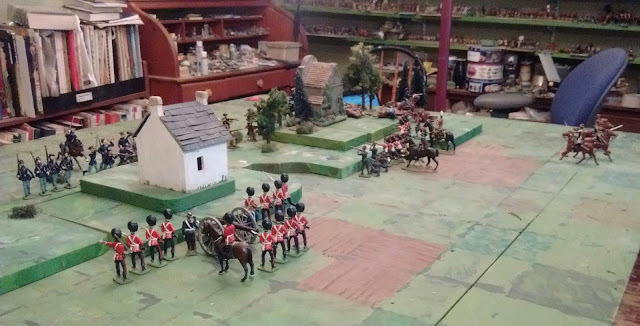 Some of their units were slow to react though and midway through the game the Canadians managed a local superiority and eliminated the Irish and took the American gun. The Americans were down 2 units routed to none. With one card left for the Canadians to seize sole control of the whiskey cart/hill top or break the American morale it looked good. They drew a red king. A free move for one unit then the initiative. They brought up the Black Watch and hit B company from 2 sides with Douglas leading the charge. 7 dice vs 3. The end seemed inevitable. Four melee rounds later the Americans had lost a figure (yes folks that's a total of 20 dice rolled by the Canadians for 5 or 6 and only 1 scored plus, a 1 by the Commander which took him out, vs 10 by the Americans for 4 hits......sighhhh) , Col Douglas was wounded and the Grenadiers routed. To the flank the Princess Louise Hussars who had charged in support were blown out of the saddle by the Rifle Association. (3 dice, 2 hits). The Canadian Morale hit 0. As darkness fell the Canadians pulled back and Colonel Lannigan sent over a flag of truce expressing regret for the accidental battle and offering medical assistance. All might have been well if cooler heads had prevailed at both upper and lower levels on both sides and if it hadn't turned out that Rocky Hill was in Canada and that Whiskey Hill was indeed in the US so that both sides had been wronged. While politicians argued about who should apologize and what penalties should be paid by whom, a low level, unofficial, yet bloody, 3 way war of border skirmishes and raids dragged on, wargame after wargame. Cyprus Incident: Action at Rocky Top Hill. Since I started my investigation into the mystery of Fort MacDuff and the secret Cyprus Hills Expedition, I have managed to get my hands on a copy of an old journal full of useful information. It was found in the attic of an old farmhouse on the Fulford Road in the Eastern Townships of Quebec, my grandfather's farmhouse as it happens but my Uncle had never mentioned it to me. The journal predates my family's immigration to Canada so it was not a family matter, purely a passing curiosity. The journal is incomplete and if the author ever identified himself or explained why he was keeping a journal about a secret expedition, that information was on one of the lost pages. However, it appears that the author was one of the officers of Montreal militia who volunteered. It also appears that volunteers came from all across the country as individuals and served in adhoc units not in their original battalions. It seems that many clung to their traditional unit allegiances despite this but it helps explain the lack of information in official sources. The first fragment of interest describes the journey westward. Apparently the volunteers travelled in small to medium sized groups by steamer then railroad to Bismarck then by oxcart train north. Along the way they met a party of armed men moving south, not just any men, but largely Irishmen claiming to be part of the Irish Guards of Assiniboyo (no doubt a corruption of Assiniboia), a soon to to be Free State. These claimed to be returning from a punitive expedition against the Nonami clan of the Nakota. (Ahh, so, not the Blackfoot after all! This makes sense since the victims in the later Cyprus Hills massacre were largely Assiniboine ). Apparently they told the story of how they and a party of US Regulars pursued a raiding party of Indians north only to be ambushed. As the whiskey flowed, the Irish boasted about their great deeds in battle but were a little vague on details. The battle as the Irish Volunteers reported it. Upon this slender reed this game was founded. For campaign narrative purposes the Colonel is under orders to pursue the raiders and punish them if possible, preferably before reaching the border but under no circumstances to allow the volunteers to carry out a massacre of non-combatants that would cause a fuss back east, especially if they strayed north of the border. In scenario terms he was tasked with capturing the rocky hill. I started the game and played through 3 or 4 turns using Orders dice but soon found that the speedy Indians were entrenched on the hill before the Americans, hampered by PIP rolls and 2 adverse chance cards, had managed to cross the river. The whole thing felt very artificial. Why were the Indians still waiting? Why didn't they ride off? After briefly considering changing scenarios I decided that I just needed to flush it out a bit. The only thing I could think of was that there was a camp full of non-combatants behind the hill. That would change their strategy all together and give them a reason to delay and fight. I also decided to revert to using a combined initiative and chance deck instead of rolling for orders dice. I pushed the hill forward, added a tepee to mark the edge of the village and reset the troops. For game purposes I declared the Rocky Hill to be to the North. First Blood. A hasty attack is repulsed. I split the Indian force into two equal groups, one crossing at each ford but decided to roll for the American units. This gave me 1 column with a cavalry and an infantry unit and another with the gun and three infantry. I decided to put Lannigan with the cavalry. Seeing the amount of firepower being ranged against them the western party, including Walks Tall, beat a hasty retreat towards a patch of woods and the hill. On the Eastern flank the braves decided to try to slow the enemy and do a little damage if they could. 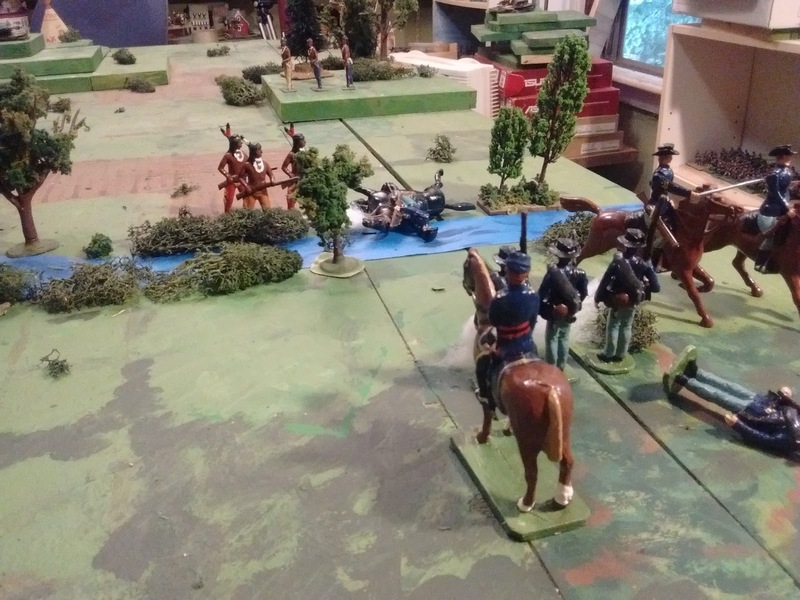 The speed of the cavalry took me by surprise and they rode onto the table and straight into contact with the ford triggering a fight. After an inconclusive round the cavalry pulled back. This allowed the Indians to fire into the infantry achieving 2 hits on 2 dice. Lannigan spurred forward through the hail of bullets and steadied B company (cancelling 1 hit). On the next turn B company fired getting a hit on the Indians which they converted to a retreat, jumping on their ponies and galloping off. The cavalry seized the opening and splashed over the ford to attack the now exposed flank of the remaining unit of warriors. 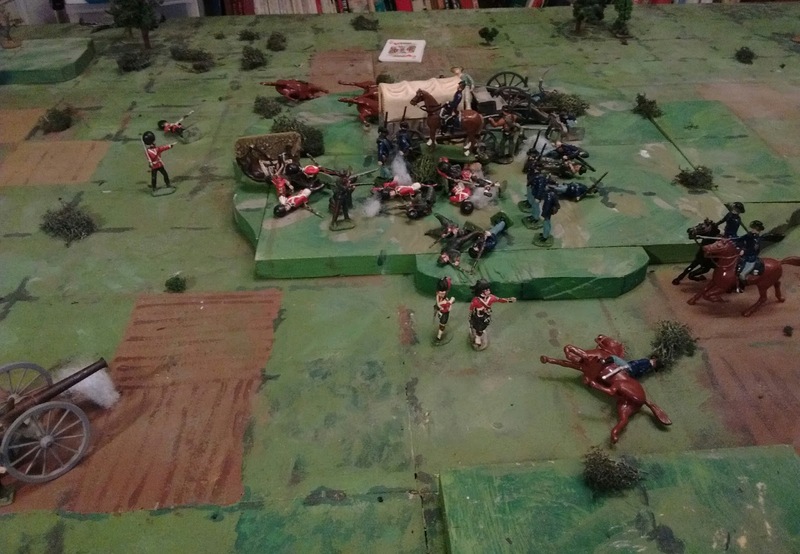 The cavalry did lose some impetus in crossing but were supported by the infantry. It was 3 dice vs 1 and Lannigan was astonished to see the first stragglers racing back in disarray. He briefly considered spurring forward to inspire them but the day was young and the bugles were already sounding the recall and rally. Across the stream the Indians hopped on their ponies and fell back, a job well done. 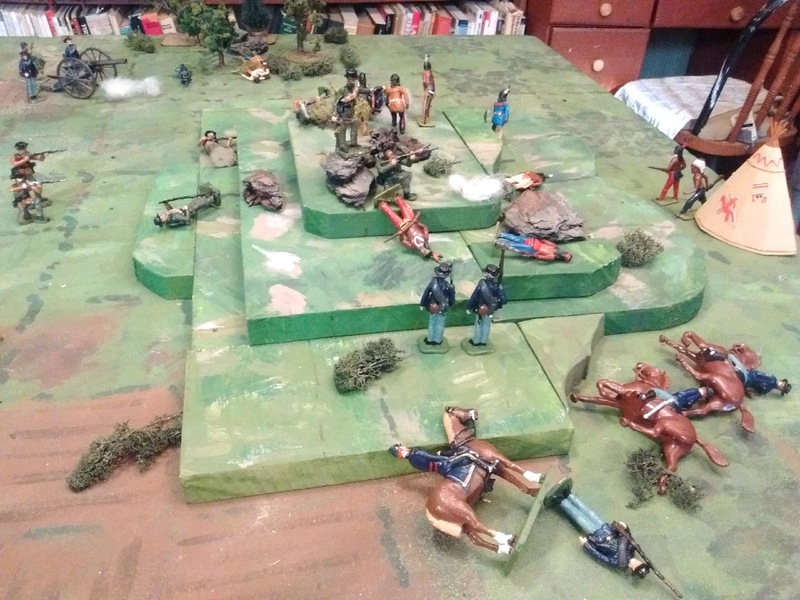 The next few turn turns saw the US struggling to get men and guns over the fords and deploy while the Indians took up positions in the woods on either side of the battlefield as well as on the rocky hill. Suddenly the young Captain in command of A company found a shallow gully that allowed him to move forward unseen while the gun opened fire and surprise the Indians in the woods. (chance card - free move between turns). At the same time as A company charged the woods to the West, B company charged the woods on the East. Both attacks were complete successes sending the Indians flying with losses though A company also lost a man. With both American wings moving rapidly past the hill while the volunteers and gun moved against the centre to provide fire support, it looked like a done deal but the rocky hill provided good cover and the fleeing Indians rapidly rallied and used their ponies to regroup on the hill before the assault went in. At close range the Indian fire is devastating, the cavalry and A company are routed and Colonel Lannigan grievously wounded. The first assault was met at close range by a storm of bullets and arrows from hidden enemies. When Colonel Lannigan went down the heart went out of the men and the survivors of B company hunkered down to trade pot shots with the enemy. As the sun set, the volunteers couldn't stand the inaction anymore and rising to their feet they stormed the hill with wild cries. The Rifle Association was bloodily repulsed but the Irish, disregarding their losses all but routed the Chief and his band and crowned the hill. It was too little too late. The American morale had dropped to nothing while the Indians were in fine fighting spirits despite their losses and the sun was setting. It was time to get the wounded and get out of there. In technical game terms Blue's army morale was 3 units or leaders lost while Red's army morale was 2 units or leaders lost. Blue had lost their commander and 2 units while Red had lost 1 unit. The scenario victory condition was for Blue to capture the hill by the end of turn 15. Blue had captured one square of the hill on turn 15 but not the rest and his morale was broken so that didn't count, it just gave the Irish some bragging points. Looked at another way, the US lost 12 out of 23 figures while the Assiniboine lost 6 out 13. (By the way the rules assume roughly 10% of hits are killed, seriously wounded or missing, the rest are what might be termed temporary or "shock" hits.) Since it had various turns of advantage and lasted 15 out of 15 turns with no decision till the end of the 2nd half of the last turn, it was a close game no matter how you look at it and was an hour well spent. The next battle will probably involve a "discussion" about the exact map coordinates of the Battle of Rocky Hill and of the chosen building site of Fort MacDuff. It seems some "latitude" may have been taking with the calculation in each case. The first shots have been fired in the Cyprus Hills Incident. Warriors of the Nonami tribe open fire on pursuing US Cavalry. 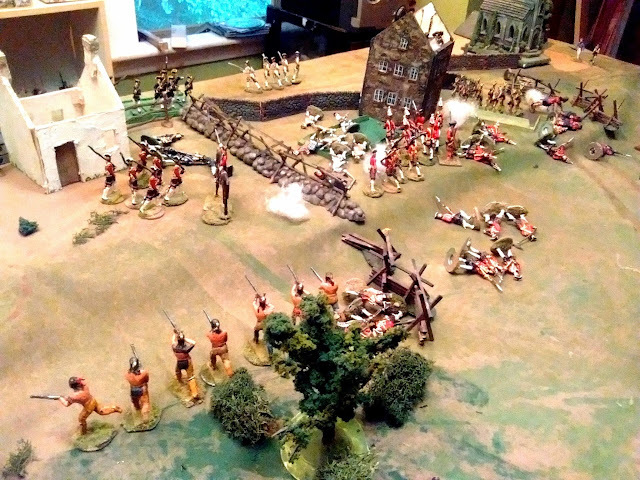 The scenario was a slightly modified version of Scenario 20 (Fighting Retreat) in Thomas's One Hour Wargames. The full story to follow. The Last Days Before the War. We have now a Quorum and a set of rules. Can a wargame be far behind? The Canadian and US forces meet in peace at the border to discuss cross border incidents. Having done my best to invent a believable setting and backstory, capable of being turned into a credible campaign, I am about to throw concern about believe-ability and continuity out the window and just use the setting as a background for a series of unrelated skirmishes as the mood takes me (which was the original idea). Think if it as a traditional TV series where the idea is just to cram as many episodes in as you can before being cancelled. This should mesh well with the 1950's toy soldier look and the artistic license taken with uniforms etc. I have decided to condense all of the various parties into just 3 armies which can each fight each other. I am planning on 6 to 12 units per typical scenario. 1st. The Blackfoot. Having just recently put the boots to their traditional enemy the Cree and made peace with their chief Poundmaker of 1885 Northwest Rebellion fame, the Blackfoot Confederacy now controls the Cyprus Hills outside of the Whiskey forts. I don't know much about their tactics but they do not seem to have had access to as many horses or modern firearms as their friends the Sioux so they are pretty much restricted to ambushes and skirmishing on foot while moving by horse. I can't fix the horse issue quickly but I can give them better guns. It might also be possible to find them some Metis allies. I currently have 8 units on hand and pkan to add a couple of Metis mounted rifle units. In game terms they are fast and flexible but with low firepower and a tendancy to give ground rather than take casualties. 2nd. The Canadians. So far for cavalry I have the Princess Louise Hussars from New Brunswick but for nearly 20 years now I've had castings for a troop of the Governor General Bodyguard so their time is nigh at hand. There is one gun and crew now plus some horse gunners currently without a gun. There are also more grenadiers, highlanders and riflemen than I can shake a stick at. Some will stay on the shelf but I want to add some redcoats in slouch hats so I may just rebadge or rather, re-hat some grenadiers. There is also room for some local scouts and some NW Mounted Rifles. 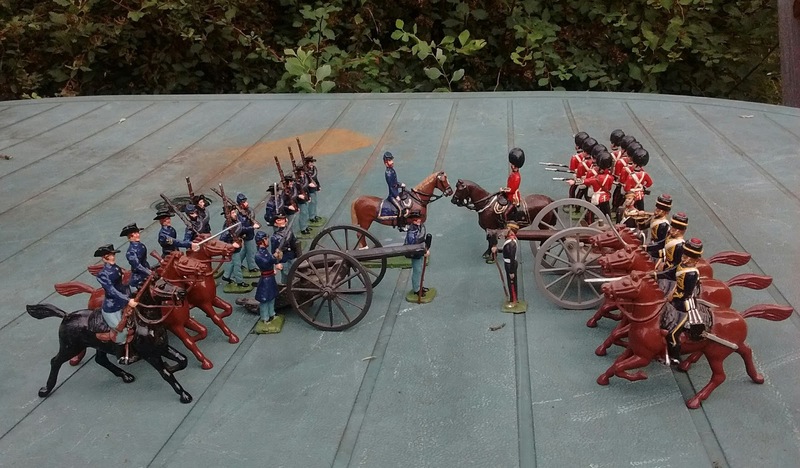 On hand I have 2 cavalry, 10 infantry, 1 gun and plan to add at least 1 cavalry and 2 mounted rifles. 3rd. The US. The core of this force will be US regulars on garrison duty in between Indian Wars. They will be supplemented (eventually) by volunteer expansionist Cyprus Hills buffalo hunters and whiskey traders and by Fenians intent on setting up an independent Irish and Metis plus American republic but acting as volunteers to back up the US regulars in this moment of crisis since they "just happened" to be in Bismarck when the outcry for a cross border punishment expedition against the Blackfoot "just happened" to erupt. On hand there are now 1 cavalry, 2 infantry, 1 gun plus 2 volunteer infantry. Planned additions include 4 more infantry, 2 more volunteers, 1 cavalry, 1 mounted rifles. 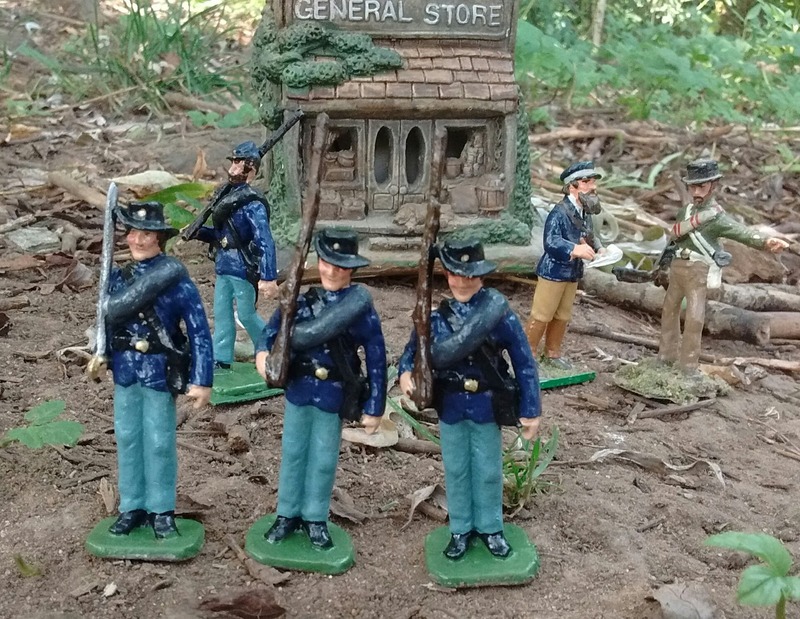 Since the idea was to suggest units bought off tge shelf (without getting pedantic over details), most will be in ACW garb including volunteers in Confederate Butternut and grey. The rules will be an adaptation of the Tin Army as used in the Oberhilse/Kapelle game last year. First game: ( hopefully on Thursday) US army vs Blackfoot somewhere ABOVE the 49th Parallel. My first US Cavalryman is now done. I had to steel myself to do the cavalry since I am basing them on some surplus 1990's Britain's Charge of the Light Brigade Light Dragoons. 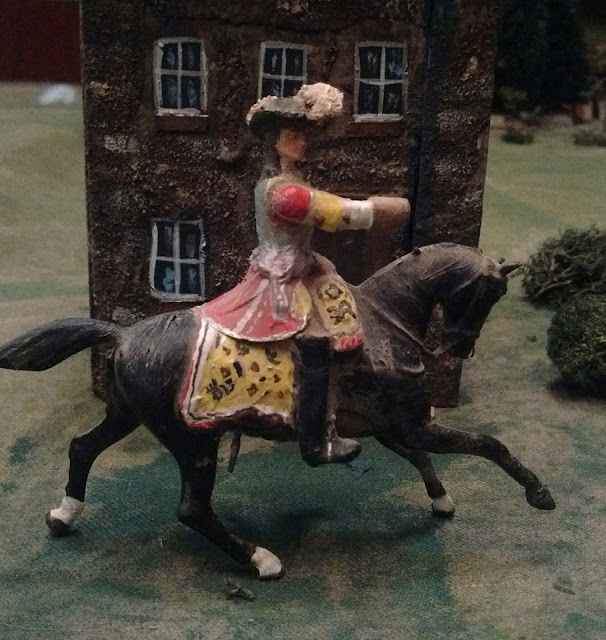 I got the cavalry at a good price at that time (thanks Stuart) and they have seen hard action in the War of 1812 and various colonial games but my Crimea game never happened. Besides doesn't the legend say that it was veterans of the Light Brigade that brought Garry Owen to the 7th cavalry? Take one battlescarred OOP Britain's Crimean Lt Dragoon (sacrilege!) 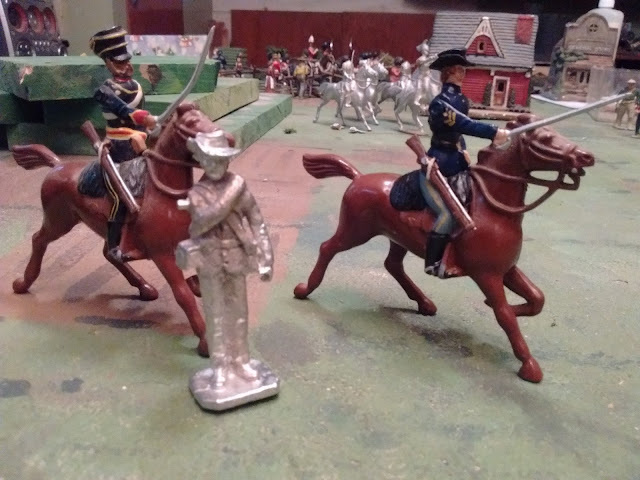 + the head from a home cast Reb from Miniature Moulds and voila, a US cavalryman reminiscent of the old Britain's Union ACW cavalry from the 60's. The next 2 will have carbines in hand as they should. My first thought was to sell the Dragoons and use the money to buy castings from Dorset but the evidence suggested that I was unlikely to make enough to pay for the replacements and anyway, not only was I rather attached to these veterans but I cut my military modelling teeth on Henry Harris's book on converting toy soldiers to models. In the end all it took was a head swap and a partial repaint. I left as much as possible alone including the horse. Still a toy not a model but he's ready for action. I just need to do 2 more plus 2 more Gunners before committing the US to battle. It'll be a motley force with a General, 1 troop of cavalry, 2 companies of regular infantry, 3 companies of volunteers (Fenians) and a gun and crew. Not much, but enough for a One Hour scenario. OK, I admit it, I'm having fun. confers with Asst Commissary General (Ret'd) Douglas. Lannigan is a MiniMolds copy of a Britain's Grenadier Officer with US Kepi headswap, Douglas is a Soldierpac recast of a Britain's General. Having named names in the last post I was going to name and post backgrounds on the commanders but I haven't finished uhhhmm....researching! yes researching them, especially since there it seems that there may be as many as 4. One of the joys of this little campaign is that I have had various moulds stowed away since the turn of the century, some well used, some barely used and others not yet used, and finally they are coming into action. It is a huge relief at this stage in my life to be able to cast a few figures then quickly paint them up in toy soldier style when the mood strikes knowing that I don't have to do a dozen, or more, of each to make a unit. Its a bonus that the money is already long spent with an eye to retirement. The original plan had 2 key ideas. It should be a game for toy soldiers rather than a serious, accurate simulation and it should give the impression that someone had assembled the armies using a combination of sets of toy soldiers by Britain's, Authenticast, etc that they bought in a department store, say Eaton's or the Hudson Bay Company Store, in the late 1950's. 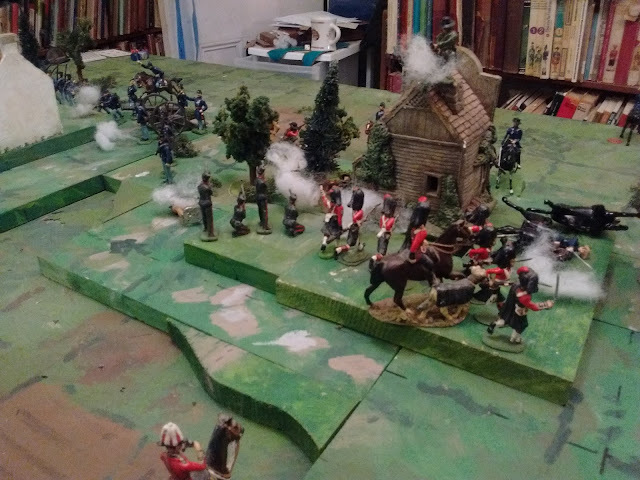 A game played on a gridded board, probably a version of the Square Brigadier, should work as long as I can get my head around the 4 man units representing only 20 or so men instead of the 100 or more than I envisaged, and as long as I can get the fort and wagons to fit the grid. If not, it might need a new custom (or bespoke as our British friends might say) set of non-gridded rules. When I began this Cypress Hills investigation, my mind was on high ideals of patriotism and justice but these things gave me no leads. So I turned to other motives, greed and a search for revenge. That led me somewhere and may help explain the cover up of what does appear to have been a well meant gambit by a very honourable man. The question, other than why, which has plagued me was how? When the Canadian militia went west in 1885 the railroad was nearly complete and despite some hardships they were able to journey fairly quickly from the cities of the East to the wild lands in the NorthWest. Fifteen years earlier when Wolsey led his expedition to Fort Garry on the Red River it took almost 4 months by boat and portage and on foot and this was only 1/2 way. The march of the NWMP in 1973 was long and arduous for horsemen. How could a similar force of Canadian infantry have made the journey in a reasonable time and unnoticed without the railroad? It would not have been possible and there was no railway yet, at least not in Canada. Now, relations between the young Dominion of Canada and its bustling neighbour to the South were rocky at times and there was still a vocal faction in the US which was in favour of annexation, at least of the North West if not the whole, but the Government had had enough war and went out of its way to discourage discord and be a good neighbour. They even offered to allow British and Canadian troops to travel west on US railroads in 1870 which would have allowed a quick trip and a relatively easy march north to Winnipeg. Naturally the Canadian government declined this affront to its young dignity. It seems unlikely that they would have changed their minds two years later but the Fenians were able to move their private armies by rail despite US government opposition. Was it possible that this Cyprus Hills Expedition was actually a privately funded, unofficial affair? That could explain the official silence, not to say cover up. But why? and why from Montreal? Who could have arranged it? It would have needed someone with connections in the North West and in Montreal and political connections to the MacDonald Government and someone with money and strong patriotic sentiments. Now I am still reluctant to names names, especially based on speculation so I emphasize that this is mere idle speculation, fiction if you will, with no intent to besmirch the name and memory of a great Scottish Canadian who made prodigious quantities of money which he spent lavishly on the public good, endowing universities, especially McGill University in Montreal, a city he later represented in Parliament, and other public institutions, one of the driving forces behind the nearly bloodless resolution of the Red River Rebellion, the peaceful inclusion of the NorthWest into Canada and the completion of the Canadian Pacific Railway amongst other things. A man who later raised and personally paid for a volunteer Canadian regiment of Mounted Rifles to fight the Boer in South Africa. We are talking of course of Donald Smith, later Lord Strathcona. You can easily google him and see the connections, personal, commercial and public with all the key players on the Canadian side. You may also see mention of the scandal surrounding the Prime Minister with hints of political contributions from railroad investors including American ones and his refusal to repay various debts by Smith incurred in the service of Canada in the North West during this time. Its not a smoking gun but it is suggestive. Now apart from the Metis rebellion, there was another threat to Winnipeg at that time, the Fenians. Having been repulsed in the East, John O'Neil along with William B. O'Donoghue, and John J. Donnelly, (what a set of rebellious names!) decided to grab Winnipeg, hopefully in collusion with the Metis. Riel and the majority of Metis weren't interested as they basically wanted to join Canada as long as their rights and lands were respected so they rebuffed his advances. A force composed of Canadian militia and local volunteers including both English settlers and Metis was raised to meet the Fenians but the raid when it came was a farce which was stopped by the US army on their side of the border, or so we are told. There are a lot of unanswered questions such as why was no one charged or held, why was the party so small and what happened to all the men, arms and money that had been gathered? Let us note that O'Neil's base in St. Paul was not the western end of the railroad, that the US was involved in a series of Indian Wars in the west with tribes that did not recognize the Canadian-US border and who had not all surrendered their sovereignty and that the western US armies contained a lot of Irish soldiers, not all of whom were completely happy with how they were treated. Looking at the Red River affair, the Metis support against the Fenians, the Indian vs US situation south of the border, the troubles north of the border between American citizens and native Americans and the welcome later offered to the Redcoats of the Northwest Mounted Police when they arrived, I may have been misled by my familiarity with the 1885 rebellion. Perhaps this had nothing to do with Canadians vs Metis and Indians but was rather an attempt to block a plot to establish a free Irish republic north of the 49th Parallel supported by civilian elements eager to profit by expanding north and by rogue elements of the US army in league with the Fenians or with a grudge against the Indians? Additional elements of the US armies may have been drawn in during the confusion perhaps due to misinformation leading to an unholy mess which the government was only too happy to bury. What if the governor of the region had had advance warning and knew that the North West Mounted Police would not be able to be formed, trained and march west in time and used his contacts and money to raise a small body of volunteers to be secretly conveyed in civilian clothes by steamship and railroad from Montreal to Bismark, North Dakota, then north by wagon to the Cyprus Hills to found and garrison a fort to defend Canada's sovereignty, possibly ostensibly as HBC employees or similar? The militia in Montreal had been trained hard to face the Fenians and had several times answered the call but apart from the Guides, they did not see action. Surely there could have been found a hundred or more volunteers to go discretely west for another stab at the Irish foe? And knowing the Canadian militia it would have been hard to stop them from packing their uniforms. OK maybe not full dress complete with bearskins but it was the prerogative of illustrators and toy soldier makers to portray soldiers in their Sunday best. Of course it is still possible that the plains Indians viewed this as a three sided conflict which would make for a messy wargame campaign, although one full of possibilities including inter-tribal conflict, but that is a question that only time and more investigation can answer. 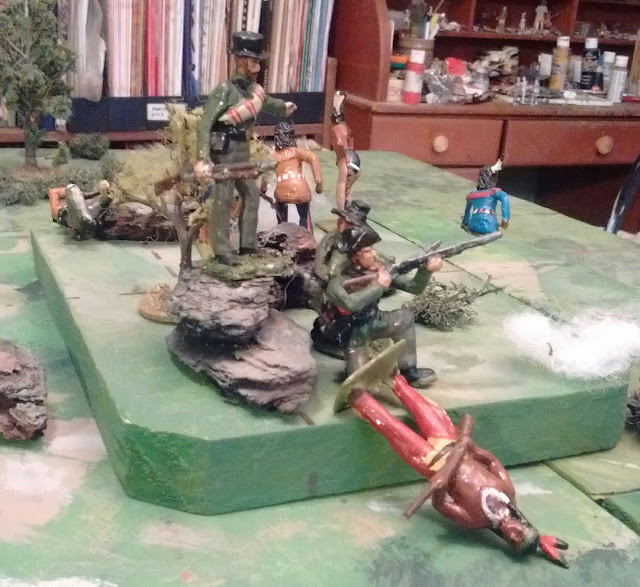 Once the unpleasant drudgery of completing the mounting of four MacDuff companies onto trays was done I decided to treat myself by basing up some of my aging 54mm toy soldiers and then resumed my investigation into the mysterious Cyprus Hills Expedition. The Hochelaga Fusiliers practicing Skirmishers and Supports drill under the watchful eye of the General. I'm not quite ready to name names yet but my investigation is progressing. It is hard to fathom how this whole thing could have been so hushed up if it was part of such a well covered campaign as the NorthWest Rebellion so I decided to cast my net further. The late 19th Century was a period of rapid development and I doubt that a war, even a small one, could have been hushed up. I decided to start looking at the 1870's. It didn't take long for clues to start adding up. The late 1860's and 70's were tumultuous years. South of the border these were the days of the classic Wild West, of Indian Wars and of Rail Barons racing to win and lose fortunes. North of the border the threat from the Fenians helped push four British colonies into Confederation only to have new troubles arise when Canada's acquisition of Rupert's Land brought armed rebellion, lawlessness and renewed Fenian threats. The 1873 Cyprus Hills Massacre is often cited as a reason for the formation of the NorthWest Mounted Police but in fact they were already proclaimed and forming when that incident took place. 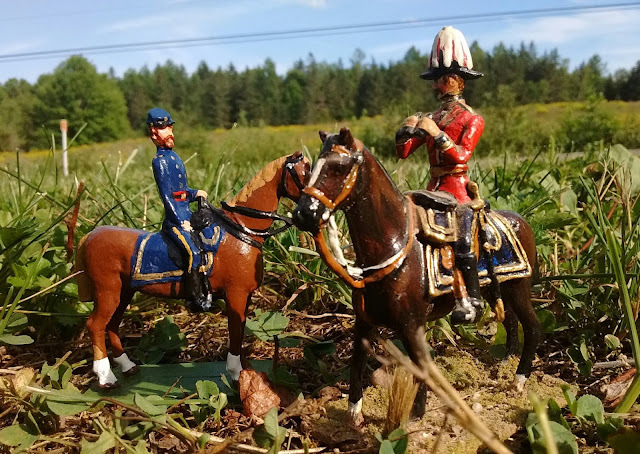 The initial proposal was actually for a military regiment of Mounted Rifles not a police force and it sometimes seems odd that a government so ready to starve and cheat the native population should suddenly be so much in a hurry to give them the protection of the law. The original proposal seems more likely given the 1870 Red River Rebellion, the 1871 Fenian Raid on Pemberton ( or debacle if you prefer) as well as the danger that the American Indian Wars would spill over the border. So what happened between the 1871 Fenian fiasco and the 1873 Cyprus Hills Massacre that downscaled the need for a military force to the need for a Constabulary? Could it have something to with the mysterious lost Expedition? We know from his memoirs that Flashman was in the area at the time, it's a pity he is silent on the issue. Our investigative reporters are on it and new information is sure to appear soon.